Who remembers the old days? Days when IPOs had ringfenced retail tranches and walking into a share shop or bank branch to buy stock in a market offering was the norm rather than the exception? Today, if you have a few bob and you want to buy shares in a promising business, you can be a step ahead of the game. In 2018, everyone has heard of crowdfunding. Less than 10 years ago, this method of raising capital wasn’t even on the map. This month, our thinktankers decipher for you this alternative investment channel. Do we think crowdfunding can compete with the IPO? Well, it doesn’t work in exactly the same way and is really more akin to venture investing. But one thing’s for sure, it opens up a fresh market for capital that puts many a company on the map and offers high potential returns on investment. Should we even be calling it crowdfunding? Here’s everything you need to know to make up your own mind. Because our readers largely live in the equity capital raising world, this blog post refers to Crowdfunding primarily to encompass equity-based crowdfunding—ie buying a share in a business—rather than donation- or reward-based crowdfunding, which are also important and fast-growing parts of this multi-faceted concept. Jake Fisher, Managing Partner of Crowdfund Research estimates that in 2015, the total equity crowdfunding volume worldwide was $2.56 billion (annual Massolution Crowdfunding Industry Report), a number that has been roughly doubling each year since 2012. His projections indicate it will be in the neighbourhood of $4 billion for 2016. Forbes is projecting that equity crowdfunding may very well surpass standard venture capital models in volume by 2020. Easy. Invest at the click of mouse. You can access a regulated crowdfunding online platform and that’s it. Up until 2012 there were less than 500 platforms — but by the end of 2016, there were more than 2,000 platforms to choose from, and that number is on the rise. Because it’s easy to connect, and because many entrepreneurs are building businesses and crowdfunding is a simple way to get development funds, it is likely to continue to grow throughout 2018. You may know Kickstarter, seedrs or indiegogo, but those platforms are not the same thing. Equity crowdfunding funds a business, not an idea, and for your money you own stock, albeit often with limited voting rights, rather than a first edition product or service. If I’m a private investor, should I choose IPO or Crowdfunding? So, which one is it: stock market or alternative investment market? With the rapid advances in technology and the rise of fintechs over the past two to three years, everyday investors have got options. On their site, OnMarket highlights that their “IPO platform has been at the front of this evolution offering everyday investors access to over 70 IPOs, which have traditionally been offered to high net worth and institutional investors”. Great! Access, then. 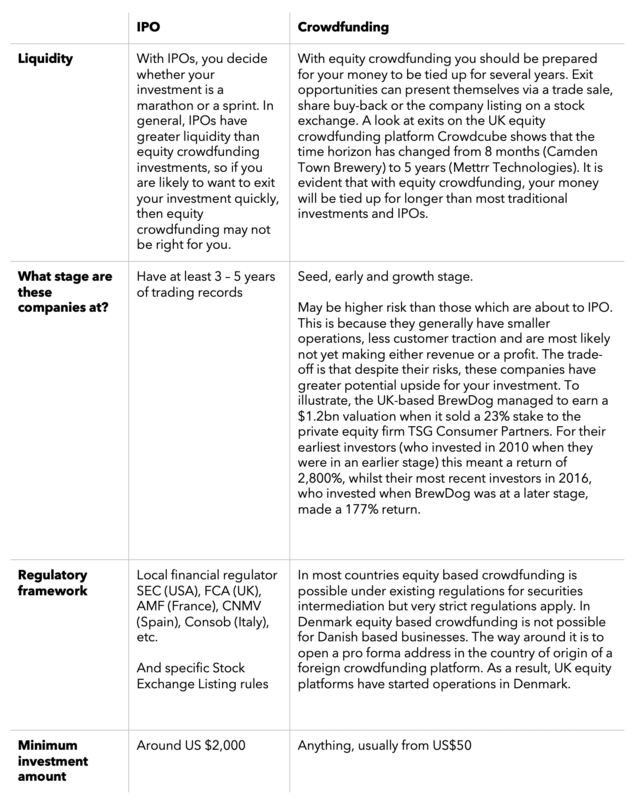 The regulators are monitoring equity crowdfunding closely and most countries are seeing legislative changes that give retail investors an even wider range of investment opportunities. Still, the golden rule of market investing still applies! Caveat emptor—or Buyer, beware. Understanding the difference between the two equity purchase options is critical to selecting the investment that is right for you. In his FORBES article Goncalo de Vasconcelos explains that the financial ‘establishment’ is starting to integrate crowdfunding into its mainstream. In 2016 “the Financial Conduct Authority (FCA) approved for the first time a leading crowdfunding platform as an intermediary to allow the crowd to invest in IPOs and private placings. At the same time, the London Stock Exchange (LSE) welcomed the crowdfunding platform as one of their official members, a highly exclusive group carefully selected by the LSE”. Is this just nuance and semantics? Cole Porter may have famously wondered PO-TAY-TO/ PO-TAH-TO, EE-THER/ EYE-THER? One thing’s for sure: when it comes to equity crowdfunding, no one’s about to call the whole thing off.